Inshore anglers had a great morning catching Keeper Drum and releasing over slot Drum. The Bluefish bite was on again today. Overall it was a slow day fishing offshore. Quite a few boats made it out this morning after 14.6" of rain since the first of the week. 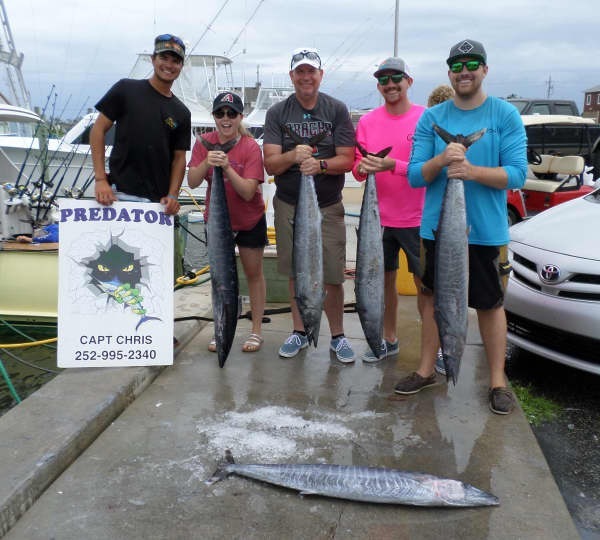 The Dolphin bite was scattered as was the Wahoo bite. 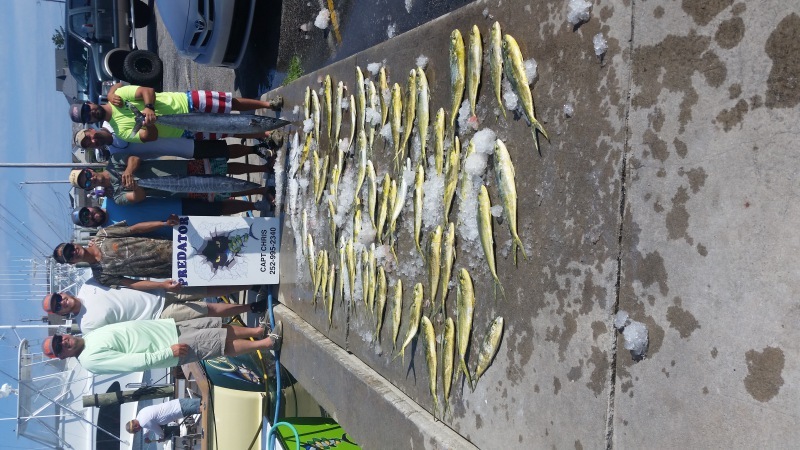 Bottom fishing included Triggerfish, Amberjack, and Blue runners. Check out the picture of a very colorful Queen Triggerfish! Everyone is gearing up for another day of fishing tomorrow - let's hope fishing improves! A repeat of yesterday with heavy rains keeping Offshore boats in. Inshore a few boats went out and caught Bluefish and Red Drum. Offshore boats were again tied to the dock with high winds. Inshore boats however were able to get out into the sound and came back with good Red Drum catches. Weather kept Offshore boats at the dock. A few Inshore boats ventured out and found good Red Drum fishing in the sound. Strong winds and pouring rain kept boats at the docks today. The wind turned SE today and made for some rough seas both inshore and offshore. Inshore parties went out this morning clamming and took advantage of the only sunshine of the day. 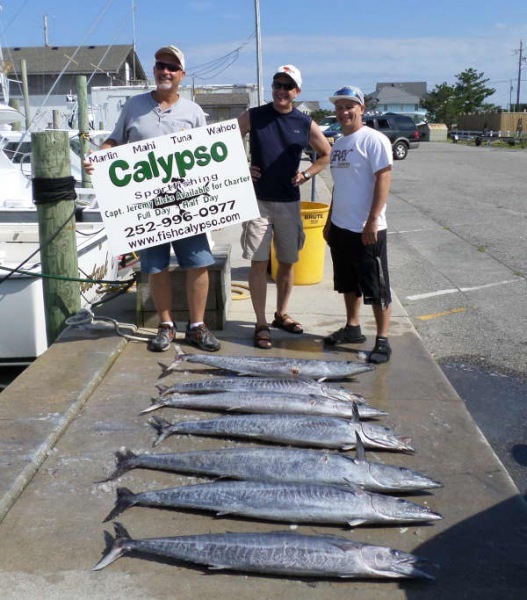 Other parties had fair catches of Bluefish and Spanish Mackerel. No one went this afternoon. Quite a few offshore boats ventured out and reported rough conditions that only got worse as the day progressed. The Dolphin bite was scattered. 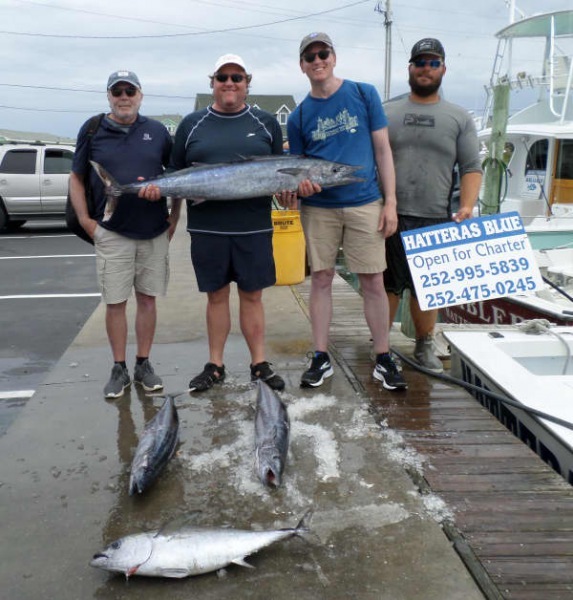 Wahoo are starting to make a much better showing and they provided a pretty good bite. 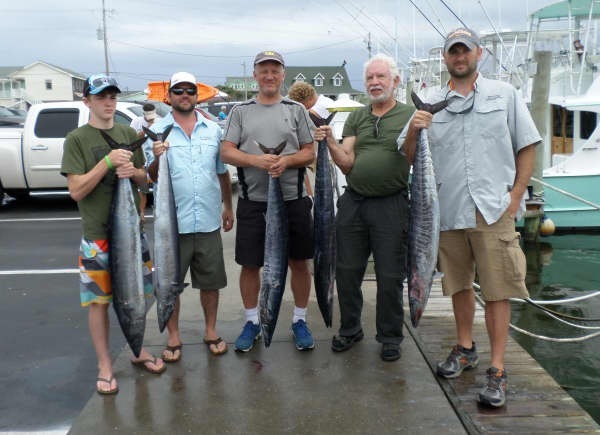 A few King Mackerel were also in the mix. Two Sailfish were released. Stormy weather is predicted for the weekend with strong winds and a lot of rain. Let's hope it clears out soon! Price Frazier of Hendersonville, TN: Sailfish release on Native Son. A wonderful NE breeze cooled things off overnight and anglers went out to a beautiful sunrise this morning! 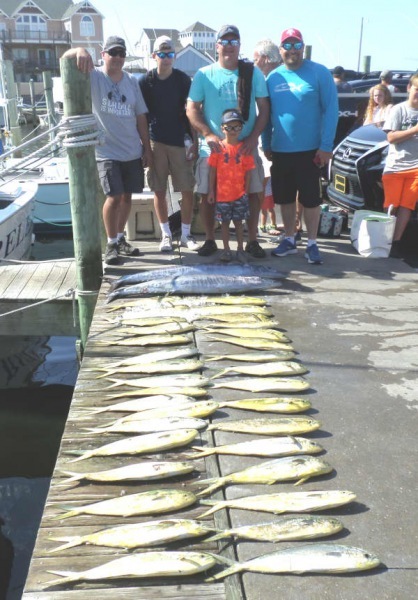 Most of our fleet went out and managed to get charters on fish. 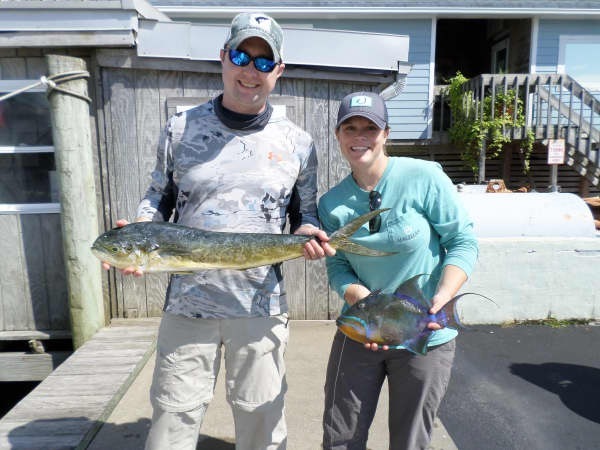 Inshore groups stayed busy with Speckled Trout, Bluefish, and big Drum releases. 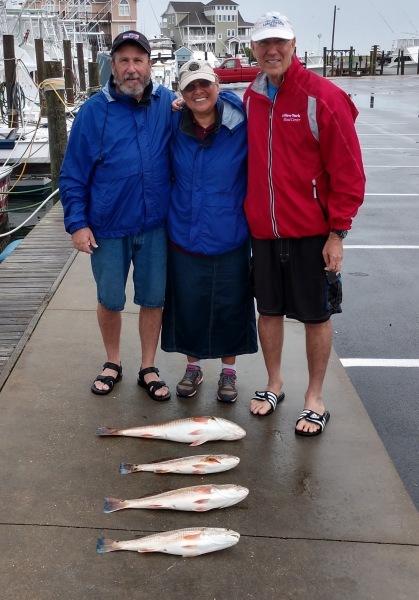 Check out the happy faces of the lucky anglers! 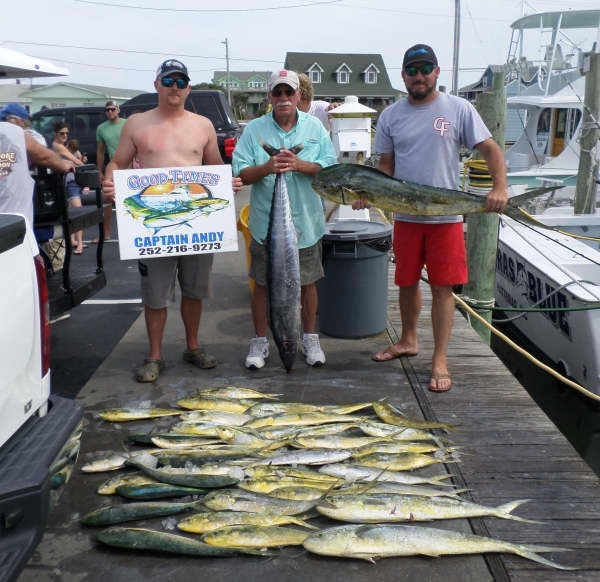 It was another scrappy day for offshore charters. Captains and mates really had to work for their catches and for most it paid off. 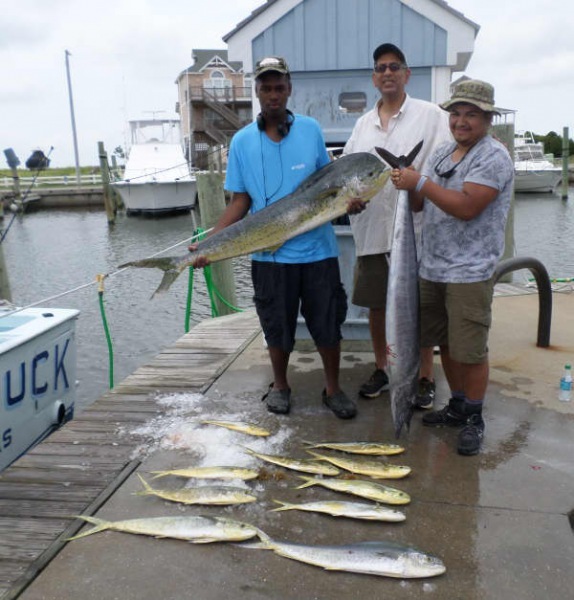 Dolphin fishing was fair to good with mostly bailers being brought in. The Wahoo bite improved greatly today. 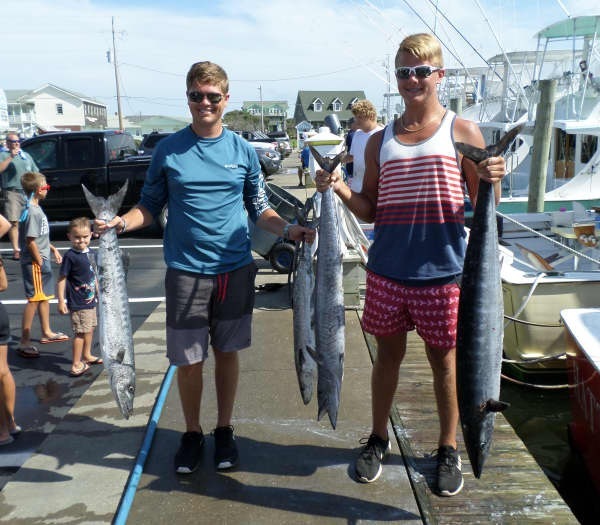 A couple of King Mackerel were caught. Two Sailfish were released. Richard Sawyer of Alexandria, VA: 44" Red Drum release on Tightline. 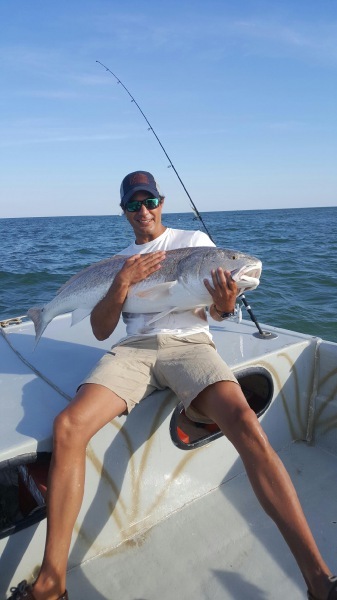 Pete Deacon of Haverhill, MA: 45" Red Drum release on Sound Bound. 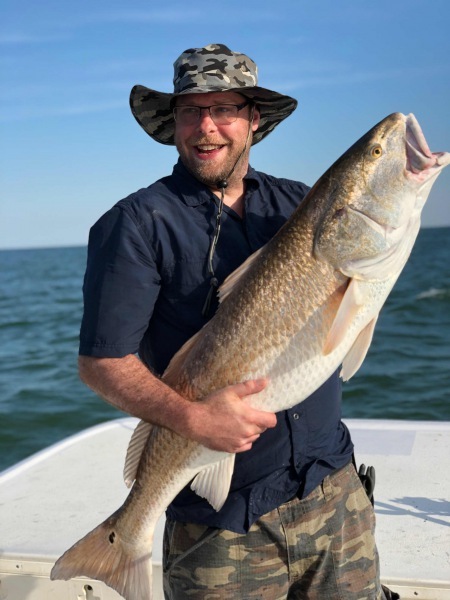 Scott Lesser of Yadley, PA: 45" Red Drum release on Sound Bound. Lawson Honeycutt of Concord, NC: Sailfish release on Big Eye. 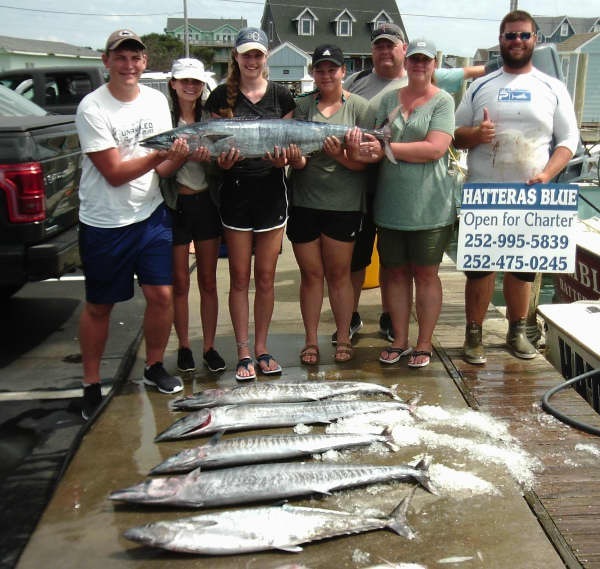 Regina White of Charles Town, WV: Barracuda release on Lucky Chip. Shane White of Charles Town, WV: Sailfish release on Lucky Chip. Michael Wallace of Stafford, VA: 50 lb. Wahoo on Native Son. Several offshore boats headed out early to the Gulf Stream for a full day of fishing. 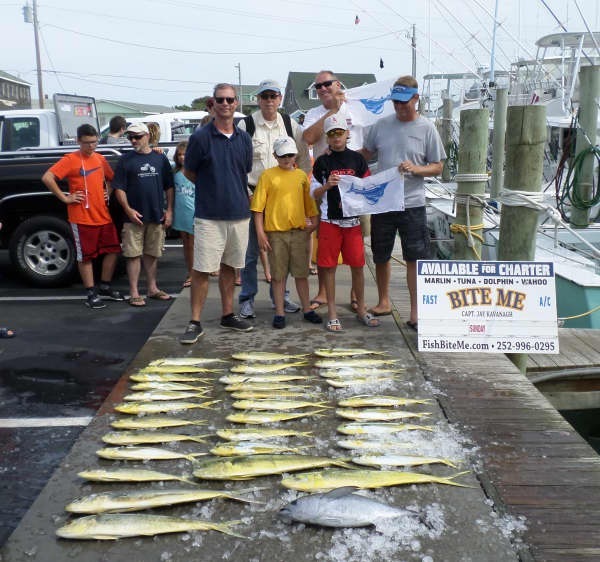 They returned with good catches of Dolphin (gaffers and bailers) along with scattered Wahoo and Blackfin Tuna. Two Sailfish were released. 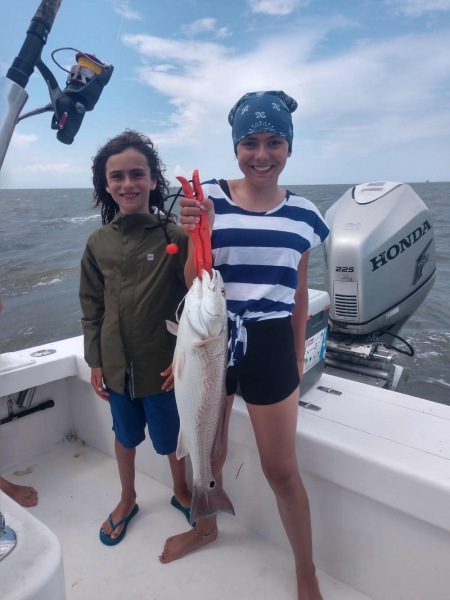 Inshore anglers focused on Red Drum, catching Puppy Drum. 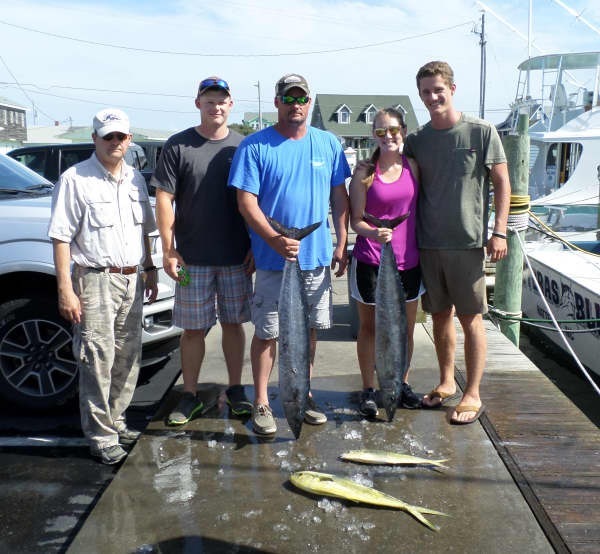 A few Spanish Mackerel were caught as well. 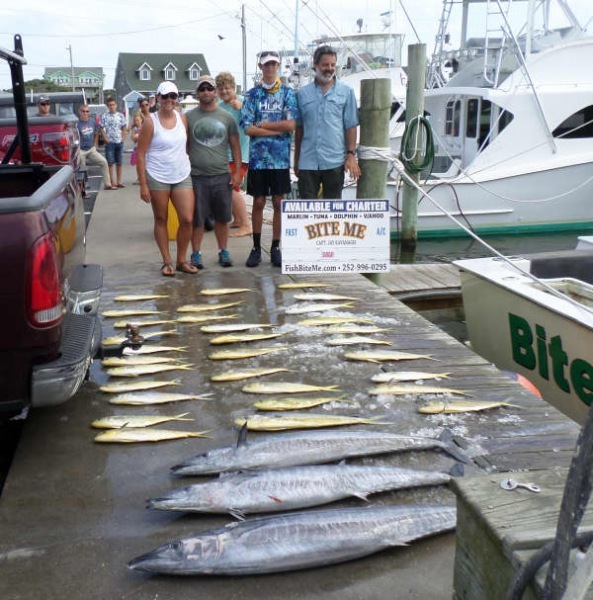 Overall fishing was slow for inshore anglers. Most boats are on the books for tomorrow, so check back to see what conditions prevail and whether or not the fish are biting! 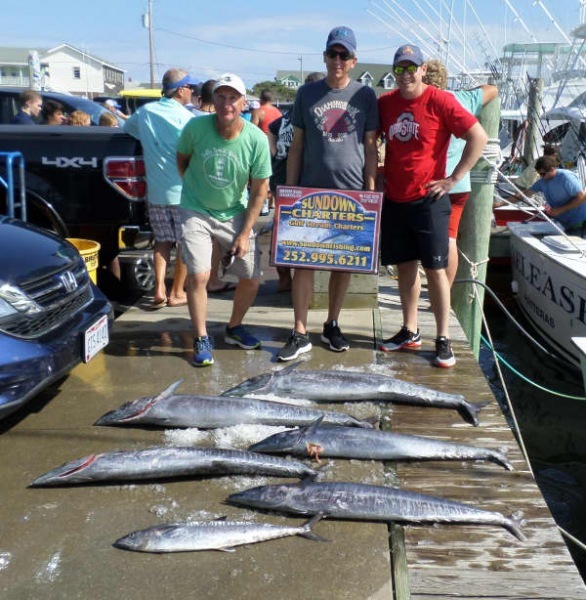 Joseph Holloway of Fredericksburg, VA: Sailfish release on Bite Me. 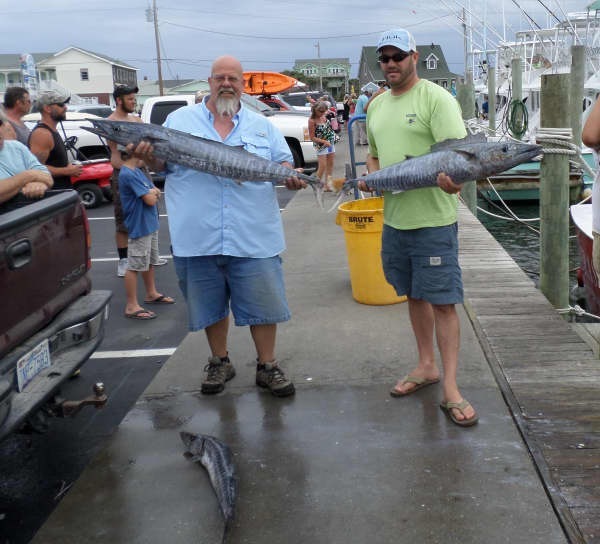 Robert Holloway of Smithfield, VA: Sailfish release on Bite Me. A few boats Offshore today that returned early as the wind breezed up in the afternoon. 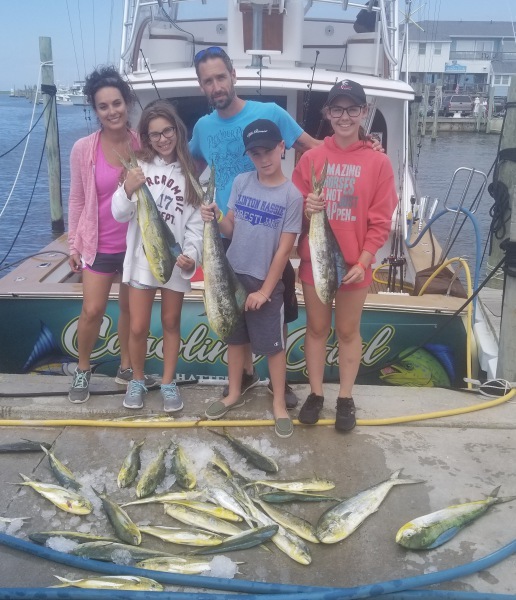 They returned with fair catches of Dolphin/Mahi. 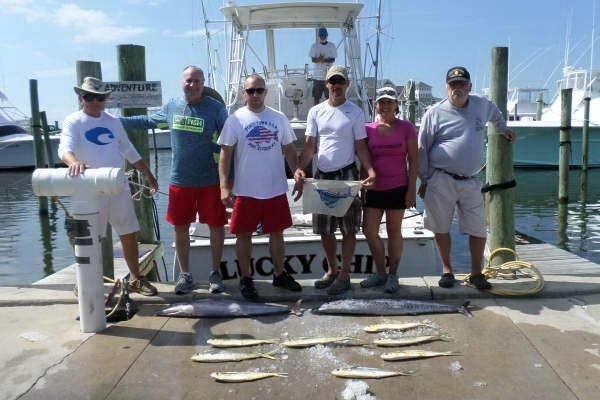 Inshore boats were catching Spanish Mackerel, Bluefish and Red Drum. 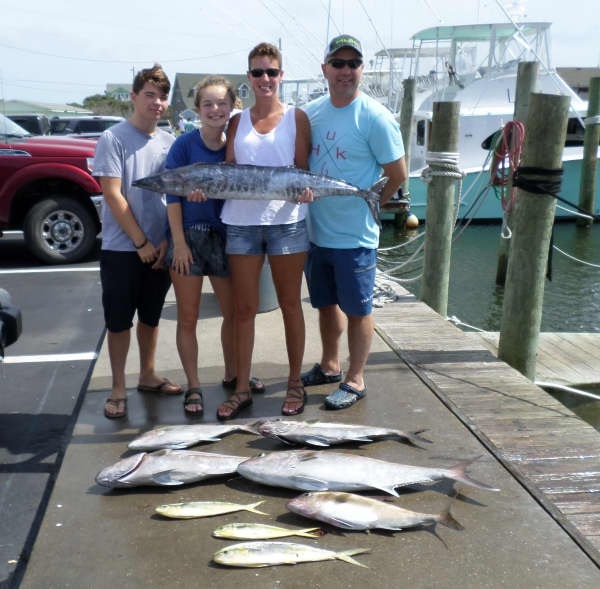 Nearshore there were good catches of King Mackerel and Spanish Mackerel. 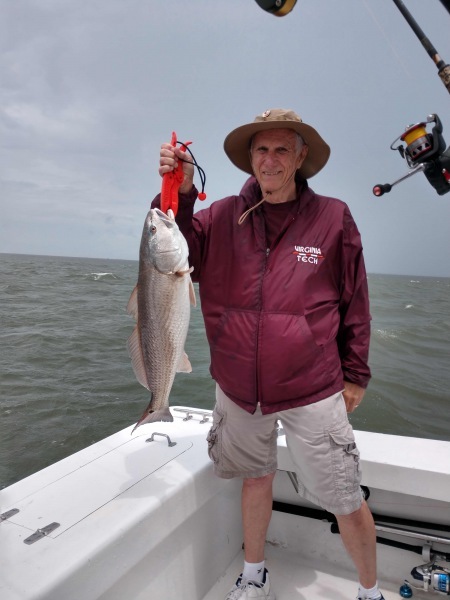 Tradition: Rocky Siesel of Cincinnati, OH released a Red Drum. 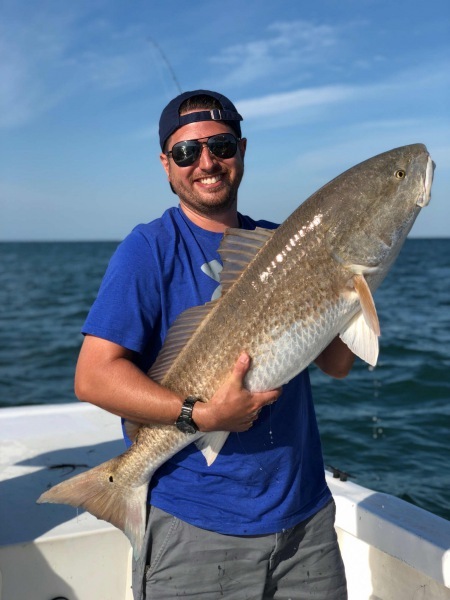 Andrew Brackman of Raleigh, NC released 2 Red Drum. Several boats Offshore fishing the Gulfstream today. 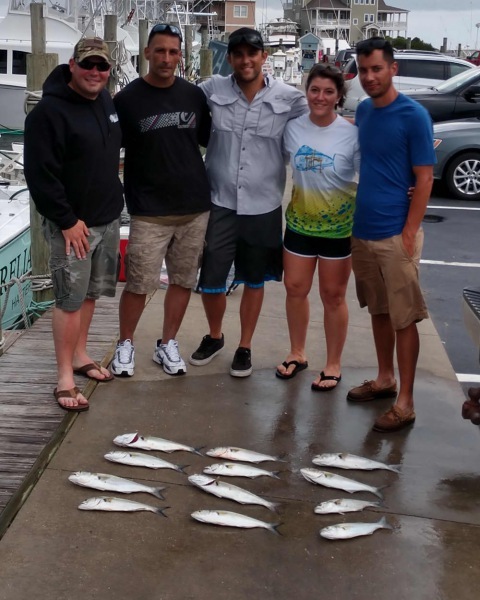 Fishing was on the slower side with a few to fair Dolphin and a scattered Wahoo. Sea Creature released a Spearfish which we don't see a lot of. Inshore lots of Bluefish were hitting the hooks and then the coolers. 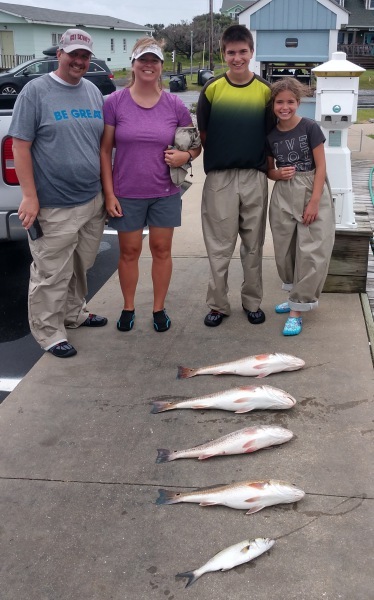 Red Drum and large Spanish Mackerel were biting as well in good numbers. 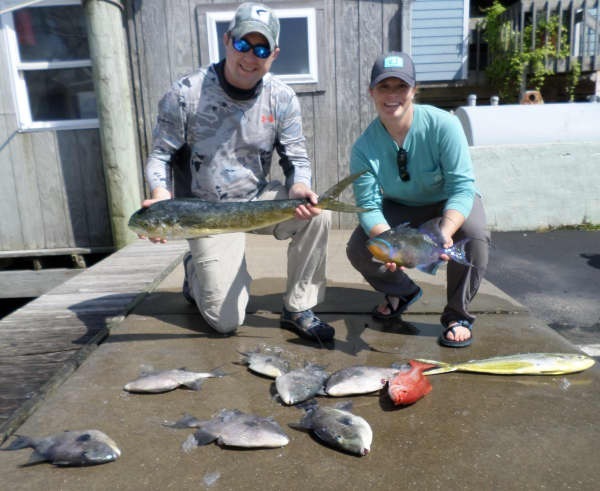 Sea Creature: Trent Krueser of Chagrin Falls, OH released a Spearfish. 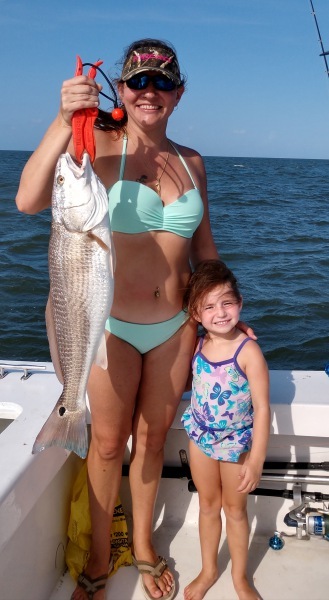 Tradition: Lauren Clem of Flint Hill, VA released a Red Drum. 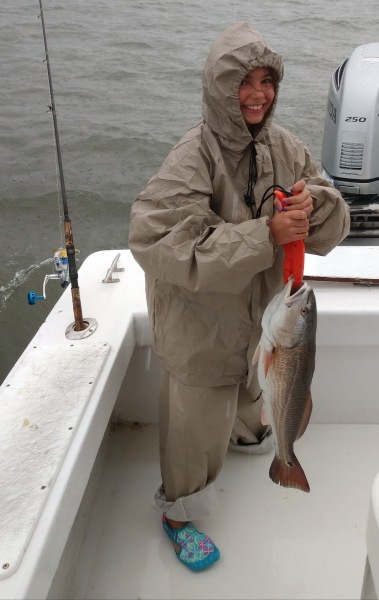 Austin Clem of Flint Hill, VA released a Red Drum. Predator: Alan Dubois of Powhatan, VA caught a 41lb Wahoo.